They are traditionally a treat to be enjoyed only in the warm summer months. But British strawberries could soon be available all year round, thanks to pioneering new technology which will help them grow out of season. Experts have developed new LED lighting for greenhouses which fool strawberry plants into thinking that it is spring rather than winter. The red and blue lights are low-energy, meaning they use less electricity than artificial white lights which are sometimes used by greenhouses. It means the strawberry plants can be kept in artificial light for a lower cost, according to researchers at Stockbridge Technology Centre in Selby, North Yorkshire. Wallings Nursery in Essex plans to use the technology this year to ripen up to 30 tonnes of fruit that it would normally have thrown away after the plants died back in the autumn. The nursery is one of the biggest suppliers of British strawberries and the extra crop from the three-hectare site is estimated to be worth £100,000. Peter Czarnobaj, product technologist of soft fruit at Sainsbury's, which helped to fund the research, said the aim was to offer British strawberries 'all year round.' 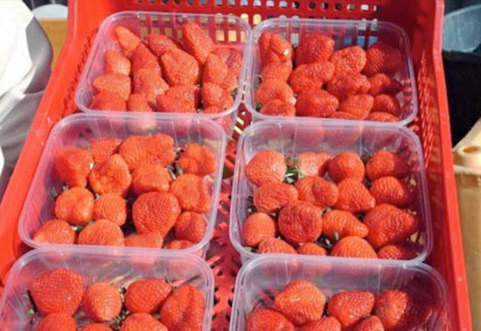 Currently, British strawberries are usually sold in supermarkets between the months of April and November. Researchers at Sainsbury's found that almost 80 per cent of its customers preferred to buy British produce, up from 55 per cent six years ago. The supermarket giant hopes to double sales of food sourced in Britain in the next seven years. Research has shown that the country is less self-sufficient in its production of fruit and vegetables than ten years ago. More than half the cauliflowers, celery and cucumbers eaten here in 2012 were grown elsewhere. The awful weather two summers ago meant Britain grew only 56 per cent of its needs. The quantities of most native apple varieties grown in the UK have fallen by more than half since 1985, with the volume of Cox's orange pippin dropping from 83,400 tonnes to 32,000 tonnes.